American Idol's judges advanced 13 artists to the next round during Monday night's two-hour episode of Season 16 on ABC. The show's judges Katy Perry, Lionel Richie and Luke Bryan were shown critiquing each aspiring singer in different cities across the country and determining whether he or she should receive a golden ticket to Hollywood, CA. 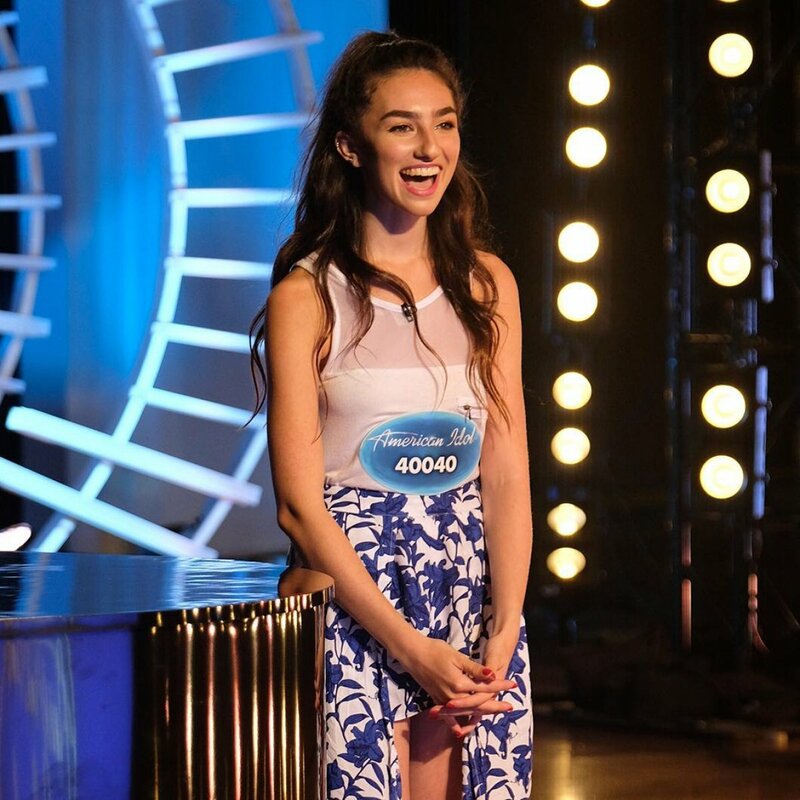 Several contestants wowed the judges during last night's broadcast, and they were Victoria McQueen, Dominique, Genavieve Linkowksi, and Amalia Watty. Victoria, a 15-year-old from East Point, GA, sang "Don't You Worry 'Bout a Thing" by Stevie Wonder. Katy said the notes in that song are so hard to hit a capella and she nailed it. Lionel agreed Victoria had perfect pitch and couldn't have been any better. "Honestly, there's something written in the stars for you," Katy told the young hopeful, who was actually born on the day American Idol premiered its inaugural season in 2002. With that being said, the "Idol baby" received three yeses from the judging panel and advanced to Hollywood. Dominique, a 26-year-old legal secretary from Birmingham, AL, performed "A Song For You" by Donny Hathaway. The judges said he handled the song with "care and easy," and Dominique's vocals gave Luke goosebumps. Katy insisted the contestant's purpose in life is to "deliver beautiful music to the world." Dominique therefore made it to Hollywood. Genavieve, an 18-year-old home school teacher from Goodrich, MI, also received a golden ticket with three yeses following her performance of "I Won't Give Up" by Jason Mraz. Katy said Genavieve is "pop magic," and she's "a little star." Lionel admitted the singer's high register reminds him of the great Celine Dion, and then Katy added that she has a lot of potential and an amazing tone to her voice. Luke noted that Genavieve could go very far in this competition. Amalia, a 28-year-old babysitter from Brooklyn, NY, sang "Make You Feel My Love" by Bob Dylan. Lionel expressed how her "range, sound and uniqueness" were exactly what the panel was looking for and she could have "a fabulous career." Katy acknowledged there are probably more dynamics in "the tapestry" of her voice she can explore, and Luke noted she's "cool and has style." Amalia therefore received three yeses from the judges. Cody Martin, a 26-year-old server from Louisville, KY, was also a standout contestant because he managed to advance to Hollywood by just singing "Happy Birthday" to Katy on her special day. Trevor McBane, a 22-year-old goat farmer from Savanna, OK, was also memorable. Lionel loved "the growl" in Trevor's voice, and Luke said while he's not perfect in his delivery, the judge believes in him because he's raw in a good way. Lionel called him the real deal, and Katy thought he had a cool vibe, so Trevor received three yeses. Kenedee Rittenhouse, a 19-year-old legal aid from Checotah, OK, performed "I Told You So" by Carrie Underwood. Lionel immediately started thinking about how they could develop her voice, but the quality of it was "right there." Katy said Kenedee seemed "sweet as country pie" and already looked like a star, but Katy wanted to hear more of her personality in her performance. Luke agreed Kenedee had the look of an "American Idol" but her voice didn't knock him out of the park. Luke said when someone sings a song by Carrie Underwood, she needs to be equal or better, and Kenedee didn't quite measure up to the country/pop icon. However, Kenedee then belted out Katy's "Firework" hit, showing she has real potential. Although Luke was "on the fence," Kenedee earned her golden ticket to Hollywood. Brandon Elder, a 22-year-old construction worker from Arab, AL, sang an original song, and Luke felt "honored" to have heard it. Lionel thought Elder was an incredible songwriter who wears his heart on his sleeve, but his singing was questionable. Katy said Brandon seemed "genuine and real," although his voice needed work. However, Brandon advanced to Hollywood with three yeses. Daniel Ethridge, a 22-year-old retail associate from Austin, TX, performed an original song, and it was a really sweet song. The judges agreed Daniel was interesting, fun and a great storyteller who could go places with his music, so they all decided to send him to Hollywood. Taryn Coccia, a 17-year-old airport singer from Nashville, TN, belted out "Masterpiece" by Jessie J. She had a great stage presence, but Katy was wondering about her artistry. Since her older sister Payton Taylor, 20, was playing the guitar for Taryn and looked like a rock star, Katy asked her to audition as well. The judges were smitten with Payton once she sang country music, and she was immediately sent to Hollywood. The panel, however, was on the fence about Taryn. Following some hesitation and deliberation, they ultimately decided to send Taryn through as well. Samothias, a 20-year-old college student from Wheaton, IL, sang "Tennessee Whiskey" by Chris Stapleton, and he turned out to be a great performer. Katy wants to see Samothias stretch his voice more, but Lionel heard Prince influence in his voice and really liked it. Samothias had the good and just needs a little coaching, so the judges opted to give him a golden ticket. And Marcio Donaldson, a 28-year-old server from Compton, CA, performed "Jealous" by Labyrinth for the judges. Lionel called the performance "moving," and Luke said he's "good," as his voice is a real voice. The vocals weren't perfect from a technical standpoint, but Katy believed he has "emotional, beautiful and vulnerable soul." Since Marcio was so talented and kind, Katy, Lionel and Luke decided to send him to Hollywood. One surprise of the night was when Britney Holmes, a 28-year-old vocal coach from Frisco, TX, performed "I Have Nothing" by Whitney Houston and was rejected by the panel despite an excellent audition. Katy said there was no feeling behind the perfect pitch of Britney's voice, and the other judges wanted to connect to her as well -- not just listen. The judges were waiting for "chill bumps" they never received, and so it was a split decision in which Katy was the only judge who gave Britney a "yes." Lionel explained that some of the best songwriters in the world can't even read music in order to better explain the panel's decision-making.